Abisola Ajani describes herself as a woman who likes a challenge – and she has extended that not only to her education but also in inspiring and encouraging other young women to follow in her footsteps in studying Science, Technology, Engineering and Mathematics (STEM) subjects. "I had enjoyable experiences studying Math and Chemistry at school," she recalls, "so that's why I wanted to study Chemical and Process Engineering. "My research into the subject while I was making my choices showed that it is a very male-dominated area but the chance to do something I enjoy as well as inspiring others to follow their dreams was a key driver for me." 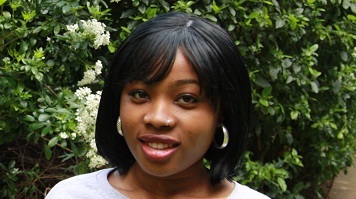 'Inspiring' is a word that comes naturally to mind when describing Abisola, who quickly settled into LSBU life to become an active member of her course and her department. "I've been the President of the Chemical Engineering Society twice," she smiles, "and have worked as a STEM ambassador for LSBU since I started my studies here. I've taken part in the 'Big Bang Fair', and promoted STEM subjects at schools across the borough." Abisola's LSBU journey began when she made us one of her choices after attending an Open Day while studying for her A-Levels. "I was able to see some of the Chemical Engineering facilities and look around the campus," she says of the experience. "I was also swayed by the fact that LSBU is one of very few universities in London where most of the buildings are on one site." As a little girl, Abisola wasn't entirely sure what she wanted to be when she grew up – but she knew what she wanted to wear - "For some reason, I always pictured myself wearing a white lab coat to work even from a very young age," she smiles. "It might not be an exact match, but I suppose working as a Chemical Engineer is close enough!" I hope to become a Chartered Chemical Engineer in the future and my time at LSBU has really helped me with that ambition. I've spent a year on work placement and made the most of the excellent networking opportunities here too. When she is asked what she has enjoyed most about studying at LSBU, Abisola's answer comes as no surprise from someone who has spent so much of her time at university giving back and inspiring others. "There's an easy answer to that question," she says. "It's the community. From my lecturers to my fellow students, it's the people that study and work at LSBU that make it a truly special place to be."